← Picture of the Week – Music on the patio at Uncorked! 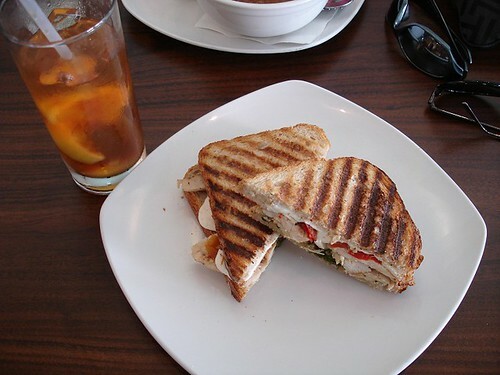 The Best Panini Ever! 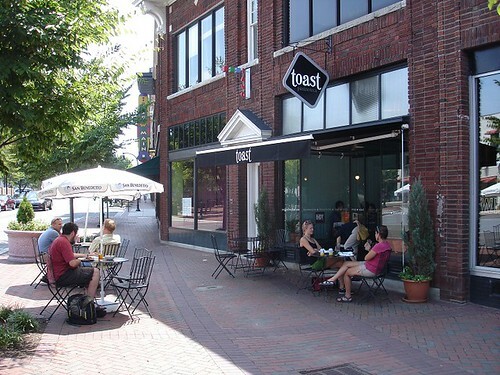 Check Out Toast In Durham! Last weekend while visiting Durham I finally had the chance to stop in at Toast to have lunch. 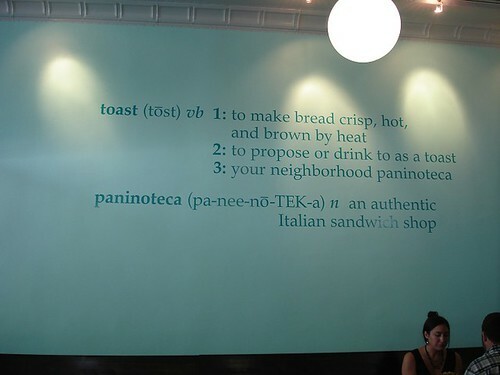 Toast is a “paninoteca” – an authentic Italian sandwich shop. Their specialities include Paninis, Tramezzini, Bruschetta, and Crostini. 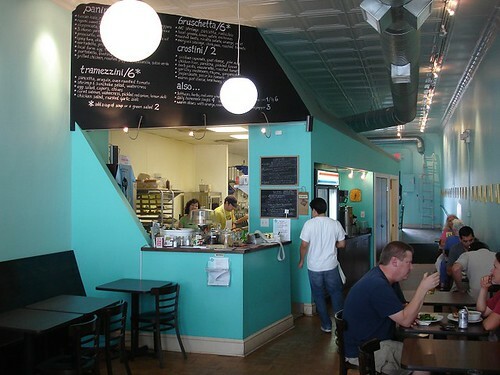 They also offer fresh salads and homemade soups and you can even buy an NC microbrew to enjoy with your lunch! They are located in the Five Points area of Downtown Durham along West Main Street right next to Whiskey. The bulk of their seating is indoors, but they do offer outdoor seating with a few tables and umbrellas out of the brick sidewalk. I’ve heard nothing but good things about the food and was really looking forward to checking it out. I was not dissapointed. The folks at Toast made the best panini I’ve ever had! I ordered the grilled chicken pannini with roasted peppers, mozzareall, and salsa verde. It was delicious. Easily the best pannini I have ever had the pleasure of easting! My wife was equally impressed with her salad and homemade lentil soup. From what I understand, whenever possible they try to use local suppliers of the produce, meats, cheeses, and bread they use in their sandwhiches. If having great local food wasn’t enough, the fact that it was so affordable made it even better. Lunch for two including a drink was just over $15. If I worked in Downtown Durham this place would be my regualr lunch spot. It looks like their good reputation is growing too. I was really impressed with how busy they were on an afternoon during the weekend. Many downtown lunch spots tend to see less traffic on weekends when the work crowd isn’t around, but Toast clearly has a loyal customer base that carries through the weekend. Toast is open Monday – Friday from 8am-8pm and Saturday from 8am-3pm. Closed on Sundays. For more info about their menu check out their website or follow them on their Facebook Fan Page. Thanks for the recommendation! We’ll be in the area in October, and will add this to our list of places to eat. I follow you on Twitter, and love your restaurant reviews. We’re moving down to the RDU area within 1-2 years and find your blog very helpful. Thank you for those kind words. I’m so glad you find the blog useful. I love checking out the different offerings here in the Triangle and reporting about them here. So little time and so many places to visit! Toast is one of the best dining experiences in Durham. I work a few doors down from the restaurant and I struggle to keep from going there every freakin’ day. Even with the weekday crowds, it’s efficiently run and consistently tasty every time. Thanks for stopping by and commenting. If I worked near Toast I would eat there several times a week too! The folks at Toast do run a great operation and it shows!